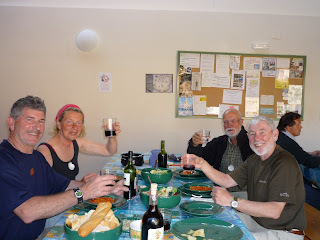 Last night´s refugio requested that pilgrims not leave until 7am so we got a little later start today. We got away about 6:50am and for the first time I started the morning without my fleece. It turned out to be a warm morning. The first part of the day was along a gravel road which parralled a major highway. Because it was Sunday, nothing was open in the first town we came to, Ventosa, so we kept plodding along another 11kms to Najera. It looked liked we were going to miss out again here but, after stocking up on fruit at the first market store we got to, we crossed the main bridge and we were rewarded with the sight of glistening metal chairs being set outside a bar right onto the sidewalk by the river. Café con leche and mini bocadillas made for a great breakfast, desayuno, for Dayton and John. This time the bocadillas were scrambled eggs with chili peppers or the traditional tortilla patatas. Heaven. Another great suprise awaited us when, just as we were leaving the town, we came upon an open market and kind of medieval fiesta; jewellry and food stands and mock fights in the manner of medieval times. Then it was up the hill and out of town towards Azofra. welcoming us into the town. In the centre of town was a big fiesta for the Feast of La Cruza. The men were cooling wine bottles in the water of the fountain in the square. Platters of chorizo, olives, chips and cheese were set out on tables in the plaza and it was noisy and festive. We, foolishly, headed straight for the alberque to ensure getting a bed but, even though we missed the fiesta, the alberque turned out to be another treat. The alberque at Azofra is another spacious, well appointed (for the Camino that is), refugio where all the rooms are double so Dayton and I got to share our own room. Now if there is snoring I can reach over and nudge the snorer to roll over and shut up. We´ve done a major laundry so every single piece of clothing we´ve brought is clean and dry. Up to now ´wash and wear´has really meant ´wet and wear´and sometimes it means áir and wear. After all the washing and showers, we went into town and bought groceries for dinner. Dayton and John are going to make a pasta, tomato, garlic, red pepper and chorizo dish and we´ve got vegetables for a salad. And by vegetables, I mean lettuce, tomatoes and onions. I don´t know where all the vegetables we see at the supermarcados go but they never show up in a pilgrims´meal. We´re teaming resources with a German couple. Dayton and John are muy buen cocineros - good cooks. 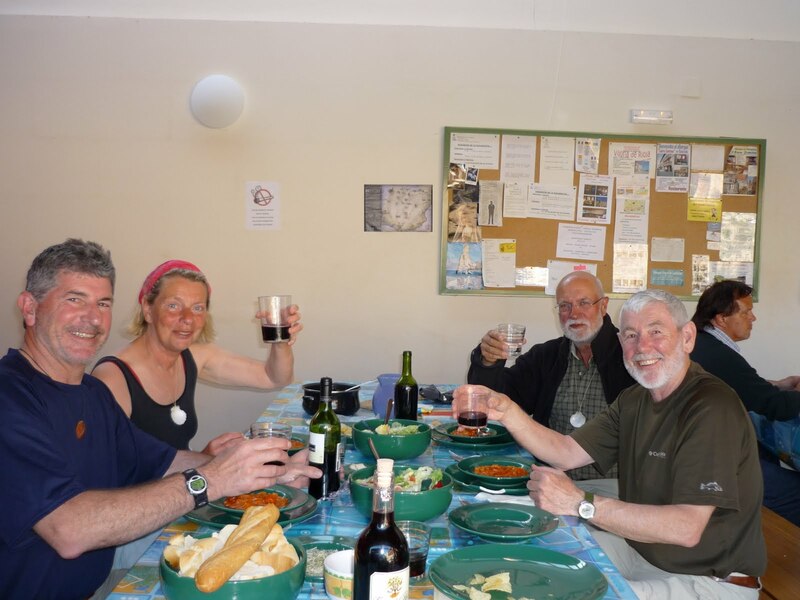 I´m getting acclimatized to the communal living but only happy with the wining, dining and visiting part of it, not the sharing the showers and dorm part. However, we are, at the moment, contented pilgrims and we welcome what the Camino has in store for us tomorrow. Hmmm, and hope it´s nice, dry, even terrain and not 40kms. Great blog Karen! Take care of the "Old Man" for us Langfords.